Renovating your kitchen can be inspiring, messy, creative, exhausting, fun, annoying and necessary all at the same time and when you add up all the costs, its can be very expensive. At Granite Selection, we want you to have the best final product possible, which is why we’ve outlined several ways to save money on your home renovation. Unless you are an interior designer or contractor, it is unlikely that you are familiar with every option for every product that you will need in your kitchen. Before buying the expensive products right away, do some shopping online and in stores to see what else is available. Who knows, you may find something you like better that happens to be less expensive. To avoid costs on maintenance and replacement down the road, we suggest you use granite for your countertops. At Granite Selection, we offer a variety of colors and styles in every price range to fit your budget and give you the durable, beautiful stone countertops you’ve been dreaming of. It is a common misconception that when you do a kitchen renovation, everything must go. Not true. Your cabinets may suit your new kitchen design just fine! Try sanding them down and painting or staining them a new hue. Replacing knobs and handles with new designs are also a low cost way to make your cabinets feel like new. If your cabinets are too damaged to be reused, instead of using hardwood, install solid wood fronts or particleboard boxes on each cabinet. This will save you between $200 and $400 per cabinet. Just like your cabinets, your appliances can stay if they are still performing correctly. Take the time to repair and clean your appliances so they look and feel brand new. If you simply must replace your appliances, do your research and consider what you need each appliance to accomplish before making any purchases and remember that they are there to cook food, not just look nice. When designing your new kitchen, try and keep your stove and kitchen sinks in the same places. Moving pipes, and drains can cost you around $2,000. Move other pieces around if you want to make the space feel different. Plan ahead of time. If you can get your electrician to update your lighting while he’s already there for other electrical work you can save money on a return trip. You may also want to consider incorporating energy efficient LED lights to save you some money down the road. Changing your flooring can be very expensive, so try painting your walls to make that dramatic change instead. Take your time to pick a color or wallpaper pattern as the walls is one of the few things that can determine the style/theme of your kitchen. If you have decided that the flooring absolutely must go, despite the costs, try vinyl as a substitute for tiles or laminates as a substitute for hardwood. If chosen correctly, these alternatives can look just as nice as the real thing at a fraction of the cost. Do only what needs to be done and be practical. Doing a full-scale renovation with topnotch materials can cost you upwards of $20,000. Pick a few things to change at a time and you’ll be surprised how new your space can feel with small changes here and there. While it may seem easier to make decisions as you go, in order to keep renovation costs in check you need to plan ahead, be willing to compromise, and put logical solutions over emotional ones. 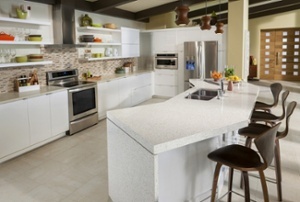 To look through our wide selection of natural and fabricated stones to see what will go best with your new kitchen design, visit www.graniteselection.com.